Israel’s PM has criticised Jeremy Corbyn over his presence at a ceremony said to have honoured the perpetrators of the 1972 Munich terror attack. Benjamin Netanyahu said Mr Corbyn deserved “unequivocal condemnation” for laying a wreath on the grave of one of those behind the atrocity. The Labour leader said he had attended the event in Tunis in 2014 as part of a wider event about the search for peace. He hit back at the Israeli prime minister, accusing his government of discriminating against Israel’s Palestinian minority. Mr Netanyahu had also accused Mr Corbyn of comparing Israel to the Nazis, although a Labour statement reiterated a previous denial of that claim. The Israeli leader had commented after the Daily Mail said Mr Corbyn was pictured with a wreath near memorials of the group behind the attack. In response to the story, the Labour leader said that while at a conference, he had attended a memorial for victims of the bombing of Palestine Liberation Organisation headquarters by Israel in 1985. Mr Corbyn was also asked about a second wreath-laying, reportedly remembering people killed by Israeli intelligence agency Mossad. The Mail had reported that the Labour leader was photographed near memorials to members of the militant Black September group behind the 1972 attack. Asked who this wreath had been for, if they were not terrorists, Mr Corbyn replied simply that a wreath “was indeed laid”. But he added: “I was present when it was laid. I don’t think I was actually involved in it. “I was there because I wanted to see a fitting memorial to everyone who has died in every terrorist incident everywhere because we have to end it. However, Marie van der Zyl, the president of the Board of Deputies of British Jews, said Mr Corbyn “needs to recognise he can’t cavort with terrorists”. She called on him to apologise to the widows and children of those killed in the Munich terror attack. Eleven members of the Israeli Olympic team were taken hostage by the Palestinian group at the 1972 summer games in Munich. The hostages and a West German police officer were killed by the group, with five of the eight hostage-takers killed by German police during a failed rescue attempt. However, Naomi Wimborne-Idrissi of Jewish Voice for Labour said Mr Corbyn was in Tunis for a pro-peace conference and that the accusations were “yet another cooked-up example of people trying to attribute guilt to the Labour Party leader by association”. It is highly unusual for a foreign prime minister to get involved in a British political row. It’s even more unusual for that to happen on a public forum like Twitter. Add in the fact the Jeremy Corbyn replied to Benjamin Netanyahu’s tweet and you’re looking at a unique political moment. In his reply, Jeremy Corbyn described the Israeli Prime Minister’s accusations as false. But he also took the opportunity to say that the killing of Palestinian protesters in Gaza by Israeli forces deserves “unequivocal condemnation”. His supporters say the purpose of Benjamin Netanyahu’s message is to shut down that sort of criticism of Israel’s actions. But his critics will argue that the fact such a senior figure has got involved in Labour’s internal row over anti-Semitism shows how urgently the party needs to resolve an issue that has been hanging over it for months. On Twitter, shadow chancellor John McDonnell said Mr Corbyn had “devoted his life to promoting justice and peace” which involved “meeting people who haven’t shared those ideals”. “Having a politician like Netanyahu join the media feeding frenzy is a line in the sand,” he added. The Daily Mail has also published a video of Mr Corbyn from an event in 2013. In the video, Mr Corbyn said Palestinians had experienced “conditions in the West Bank, under occupation, of the very sort that will be recognisable by many people in Europe who suffered occupation during the Second World War”. 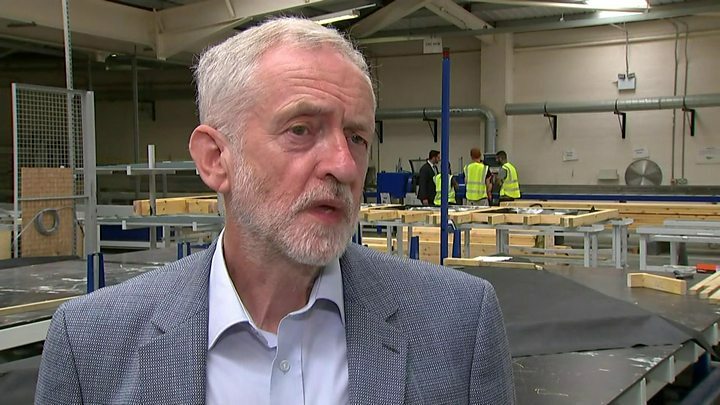 A Labour statement said Mr Corbyn had not compared Israel to the Nazis “but the conditions of civilian populations in besieged cities in wartime”. Referring to the accusation of wreath-laying, Jewish Labour MP Luciana Berger said: “Being ‘present’ is the same as being involved. Foreign Secretary Jeremy Hunt said his behaviour was “unbelievable and shocking”. In a tweet, Labour said he and other Parliamentarians had been honouring victims of the 1985 Israeli bombings. It comes amid a wider row about anti-Semitism in the Labour party. Critics, including Jewish leaders and some Labour MPs, say a new code of conduct adopted by the party is not as comprehensive about anti-Semitism as the International Holocaust Remembrance Alliance’s (IHRA) guidelines. Labour says it has included the international definition word-for-word in the code, although critics say the Labour code leaves out examples of how criticism of Israel can be anti-Semitic. ‘The only way Jeremy Corbyn can put this issue to bed is to prove everybody wrong and take the action we are all urging him to take. That is he should adopt the internationally agreed definition of anti-semitism in full. Labour MP Margaret Hodge said the only way Mr Corbyn can “put this issue to bed” is to adopt the internationally agreed definition in full.